Can you believe that summer is almost over? I have a hard time to think about this! 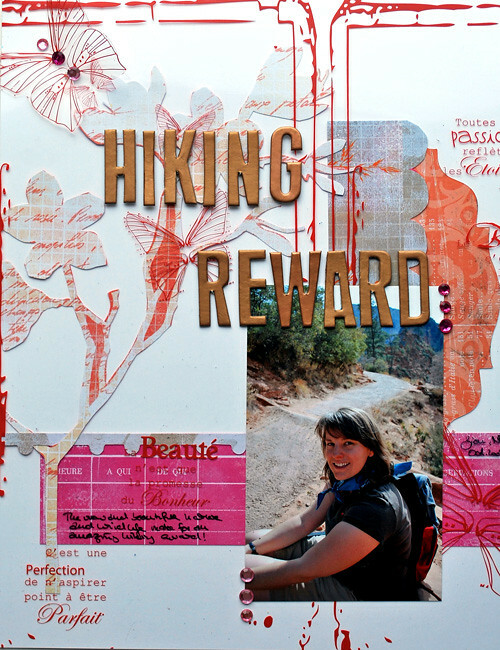 Here is a layout that I created with a photo from an amazing hike in Zion Nationalpark last year. Könnt Ihr glauben, dass der Sommer fast vorüber ist? Mich macht der Gedanke ganz traurig. Hier ist übrigens ein Layout mit einem Foto vom letzten Jahr – von einer Wanderung im Zion Nationalpark. I love the color combo of pink and orange – so the wonderful Herbier Collection was great to use for this! And the gorgeous Transparency from the Baigneuses Nostalgie Collection gave it a great finish. Orange und Pink sind echt eine coole Farbmischung ! Die Herbier Collection macht wirklich Spaß und das Transparent von Baigneuses Nostalgie Collection passte perfect dazu. Yup I agree, pink and orange is a delicious combination. teamed with the red overlay and the golden letters, thus layout is super yummy! a very “light” layout, compared to the others you normally do, but i love it! yes, well today is a gorgeous late summer day isn’t it. but still, autumn is knocking at the door! Hmmm, mal was ganz anderes! Aber sehr interessant! Das hab ich mir gleich drei mal anschauen müssen! :-) Und ich geh gleich noch mal gucken…wie die Papiere angeordnet sind und die Kombi mit den Transparency……cool!!! !